state government from doing what they should have done years ago…MAKE IT ILLEGAL TO SELL A VEHICLE WITH A DANGEROUS SAFETY RECALL. By the way, there’s still no law in Florida requiring car dealers to disclose dangerous recalls. 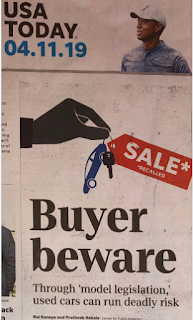 Can anyone explain to me why it’s legal to sell you a vehicle with a dangerous recall? In fact, it’s even legal to sell you a vehicle with a dangerous recall that CANNOT BE REPAIRED. Thousands of used vehicles are sold every day with defective Takata airbags that cannot be fixed because the parts to fix them are unavailable. I’ll answer my own question of why this is legal. Auto manufacturers and car dealers are afraid of the huge economic impact upon them if such a law were passed. The Florida Auto Dealers Association, FADA (and all other state dealers’ associations) the National Auto Dealers Association NADA, and Big Auto (VW, Toyota, GM, Ford, Honda, etc), combined, have ENORMOUS POLITICAL CLOUT. The auto manufacturer-auto dealer syndicate makes the NRA look “politically weak by comparison”. So, what are Florida used car buyers to do? Contact Governor Ron DeSantis, Attorney General Ashley Moody, and your state senators and representatives. I tried for two years with Rick Scott and Pam Bondi to no avail. The more likely successful course of action is to check every used car you buy at www.SaferCar.gov, the website for the National Highway Traffic Safety Association. DO NOT BUY A USED CAR UNTIL YOU CHECK YOUR VIN AND VERIFIED IT HAS NO OUTSTANDING SAFETY RECALLS. Thanks to our new Florida Attorney General, Ashley Moody and her Seniors vs. Crime members, Tony Zappone, Sheila Butler and Frank Starnella for inviting Nancy Stewart and me to speak to the seniors of South Florida this April 25th. Attorney General Ashley Moody has clearly prioritized doing more to protect Florida’s large and growing elderly population from fraud and abuse. She recently announced the formation of Florida’s Senior Protection Team that will work closely with Seniors vs. Crime and the Florida Department of Law Enforcement. The details of our public seminar on how to avoid being taken advantage of when buying, leasing, maintaining or repairing a vehicle are shown below. If you are a senior, or know seniors that can benefit from our seminar, please book this time and location in your calendar or ask them to: April 25, Thursday, 2 PM at 900 Brandywine Road is located just west of the I-95, Exit # 53, Palm Beach Lakes Blvd. interchange, located on the United Methodist Church campus. Google Maps link is https://goo.gl/maps/7qSXbXU4yV72. 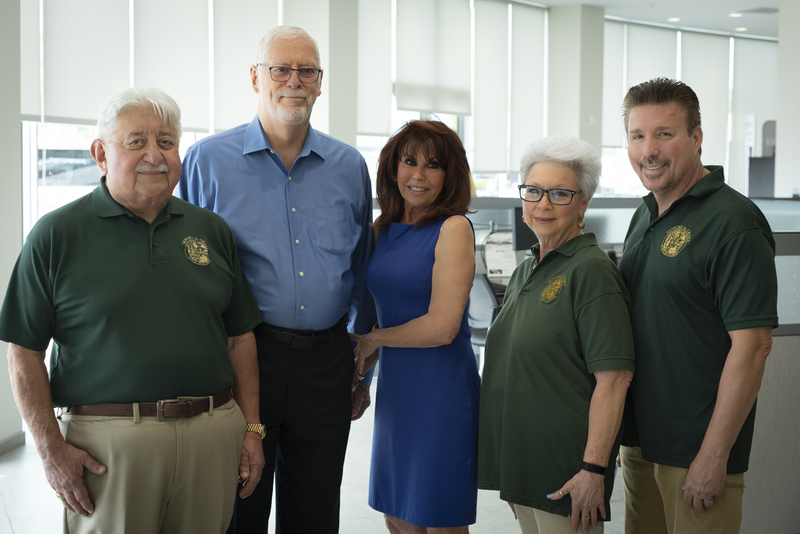 Seniors vs Crime, a special project of the Florida Attorney General’s Office, is presenting a free public seminar to educate senior citizens on how they can prevent being victimized when buying, leasing or maintaining their vehicle. The program will be on Thursday, April 25 at 2 p.m. at 900 Brandywine Road in West Palm Beach, at the Gathering Place on the United Methodist Church of the Palm Beaches Campus. Earl and Nancy Stewart will be the featured speakers. The first 500 attendees will receive a free copy of Earl Stewart’s book “Confessions of a Recovering Car Dealer.” He is the owner of Earl Stewart Toyota in North Palm Beach. Light refreshments will be served following the program. Topics to be covered include how to avoid tricks and scams when buying or leasing a vehicle, how to determine if buying or leasing is the best option, what to look for in a qualified mechanic or body shop, what vehicle safety options are helpful for senior drivers, how to get the most money for a trade in, are extended warranties a smart buy, how to shop for the best financing, and more. Attendees can submit questions ahead of time to earl@EarlOnCars.com with Seniors vs Crime in the subject line or text questions to 772-497-6530. The program site at 900 Brandywine Road is located just west of the I-95 – Palm Beach Lakes Blvd. interchange. Google Maps link is https://goo.gl/maps/7qSXbXU4yV72. Plenty of free parking is available immediately adjacent to the meeting site and the building is fully accessible. The Seniors Vs Crime Project is sponsored by the Attorney General to reinforce the message of crime prevention and to provide methods by which Florida’s senior population can be alerted to consumer fraud, con games, and other criminal acts. The purpose of the Seniors Vs Crime Project is twofold: to offer crime prevention seminars to Florida's elderly and to provide comprehensive training for law enforcement officers and other criminal justice practitioners in understanding how the aging population impacts upon the role of police and other criminal justice professionals.